Before you commence the exercise below, you need to complete Step One. 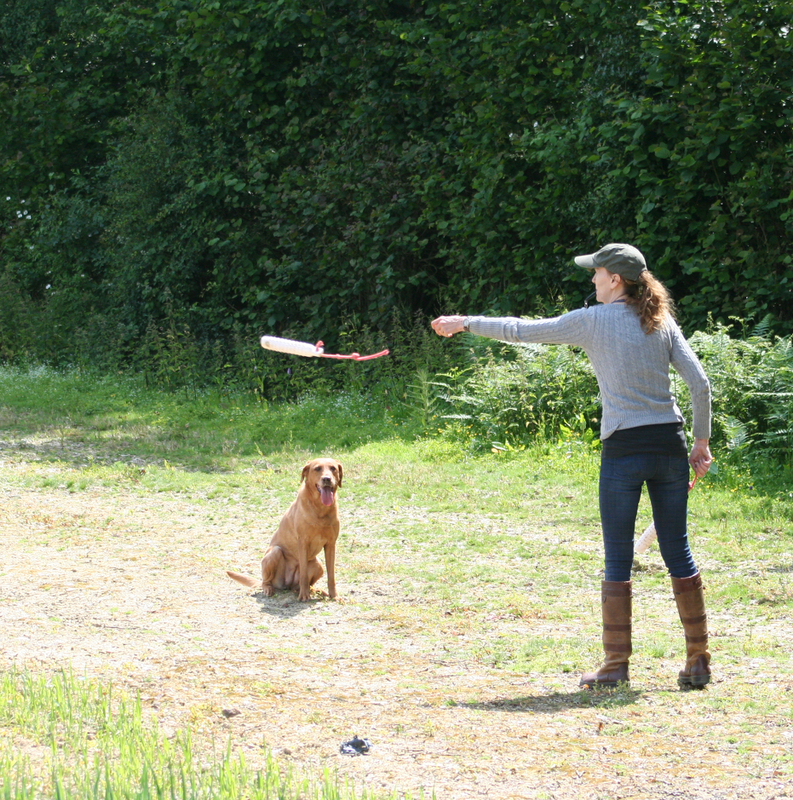 Step One was all about introducing the concept of setting off on a retrieve in response to a hand signal, from a position remote to the handler. Step Two adds a distraction dummy and this narrows the criteria for our new cue or signal. So this is not about fetching just any old dummy for his remote position, it is about travelling in a specific direction relative to you. He will understand this, because there are now two choices he could make, and we will contrive to make sure that he always makes the right choice. [wp_ad_camp_1]This is an important concept to establish, and it is surprising just how many dogs are confused by this at first. Just because the dog spins around and collects the dummy behind him at Step One, does not mean he actually understands that the back signal defines the direction he must travel relative to his handler. He is simply spinning around, because he knows that is where the dummy landed. He needs your help now, to move on. For this reason, we’ll make the new standard very, very simple to follow, and minimise any chance of failure. You’ll need two dummies in your hand for this exercise. Sit your dog so that he is facing you, with no more than a yard or two between you. Give your ‘back’ hand signal. If the dog hesitates at all, give a verbal back cue and step toward him to encourage him in the direction of the dummy behind him. If the dog tries to grab the dummy behind you (and plenty of dogs that are perfect at step one will try this) step on the dummy and do not let him pick it up . Encourage the dog back for the dummy behind him and reward him mightily for success. This is where you make the distraction, more distracting. First you will throw the distraction to 7 o’clock. It is still very near to you, still near enough for you to step on, and just that little more tempting for the dog. Practice until reliable. Now you can throw the dummy to 8 o’clock, and when the dog is reliable here too, move on to 9 o’clock. Take your time, especially if the dog is unsure. Some dogs will fly through this in half an hour, some will need three or four sessions before they are spinning around for the ‘back’ dummy without hesitation. Now you need to repeat the whole exercise with the distraction dummy thrown out to your right hand side (5, 4, and 3 o’clock) instead of your left. TIP: If you have taught your dog left back and right back, rotate him away from the distraction. 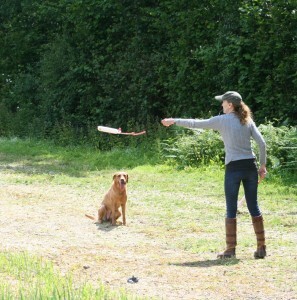 Now you can increase the time intervals between the two dummy throws and after the last dummy throw (not both at once), so that the dog has to concentrate harder to remember that first thrown dummy. Once your dog can ignore distractions to either side and still go ‘back’ on a single hand signal, you are ready to move on to step 3. We’ll look at that next time. Take your time and have fun! Having had success with stage one I looked forward to putting stage two into practice. We were off at 07.30 this morning, and started with a review of stage one to build a positive note. He sailed through the first part of the stage two exercise until other distractions put in an appearance (biting horse flies!). So we beat a retreat and I look forward to tomorrow (in a different location) when I will extend the distance the dummy is thrown and the time lapsed before I cast him. Thanks again for a very clear and logical training exercise.